XML has become a widespread format for data exchange over the Internet. The current state of the art in querying XML data is represented by XPath and XQuery, both of which define binary predicates. In this paper, we advocate that binary selection can at times be restrictive due to very nature of XML, and to the uses that are made of it. We therefore suggest a querying framework, called FXPath, based on fuzzy logics. In particular, we propose the use of fuzzy predicates for the definition of more “vague” and softer queries. We also introduce a function called “deep-similar”, which aims at substituting XPath’s typical “deep-equal” function. 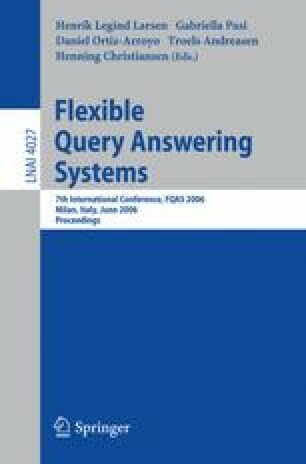 Its goal is to provide a degree of similarity between two XML trees, assessing whether they are similar both structure-wise and content-wise. The approach is exemplified in the field of e-learning metadata.